Delta Downs hosted its richest program of the season on Saturday night with another edition of Louisiana Premier Night. The 12-race card featured 10 stakes races for Louisiana-bred horses and nearly $1 million in total purse money up for grabs. After the race, Perron praised Saenz for a special talent he used to help Grand Luwegee get to the winner's circle following his first stakes win. Grand Luwegee's win came with a front-running, rail skimming trip after he broke alertly from the inside post position in a field of 10. The 4-year-old carved our fractional times of 23.91 seconds for the opening quarter-mile, 48.33 for the half, and 1:13.30 for three-quarters. At the top of the lane he owned a three-length lead before turning back a late challenge by Givemeaminit and won by a neck on the finish line. Mageez finished another 3 ¾-lengths behind in third. This year's $100,000 Sprint was taken by Wonder Run, who was guided to victory by jockey Diego Saenz, Wonder Run is a 6-year-old gelding who is trained by Steven Flint and is owned by Whispering Oak Farm, LLC. James McIngvale's 3-year-old Goodprofit proved best in this year's $100,000 Starlet while being ridden by Gerard Melancon. The 3-year-old bay runner is trained by Chris Richard. A strong rally in the stretch got Shang to the winner's circle in the $100,000 Prince with jockey Diego Saenz aboard. Shang is owned by Corinne and William Heiligbrodt and is conditioned by Hall of Fame trainer Steve Asmussen. 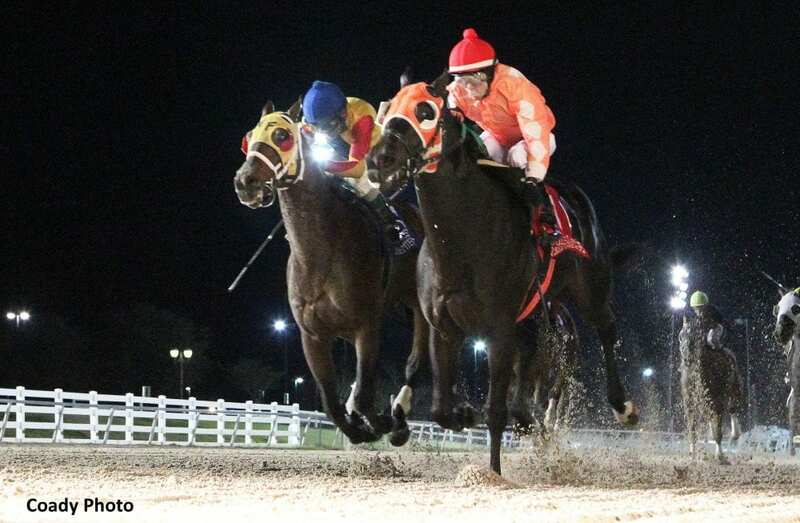 This entry was posted in Racing and tagged delta, Delta Downs, diego saenz, El Corredor, gerard perron, louisiana bred, louisiana premier night, louisiana premier night championship by Press Release. Bookmark the permalink.